There are plenty of reasons to choose a crossover SUV like the 2017 Ford Edge. For one, it sets itself apart from the rest by offering the versatility and spaciousness of a regular SUV, with the maneuverability and performance of a sedan. On top of that, it offers an efficient ride that makes it a great choice for families. 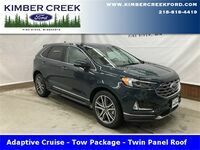 Whether you’re looking for an efficient vehicle for your daily work commute, or want something the whole family can ride in, the Ford Edge is a model that everyone can appreciate. Another major selling point of the 2017 Edge is its undeniable style. It features an aggressive Ford front fascia that’s recognizable and creates a commanding presence on the road. The Edge also offers and aerodynamic shape and sleek body lines to improve efficiency and give it an instantly-recognizable element of style. With three engine options to choose from, it’s easy to get the performance you want out of the Ford Edge. Standard features include a 2.0-liter, 4-cylinder engine that creates 245 horsepower and 275lb-ft of torque. Other available engines include a 3.5-liter V6 engine that produces 280 horsepower and 250lb-ft of torque. The final engine option is a 2.7-liter V6 that creates an impressive 315 horsepower and 350lb-ft of torque. Depending on which engine you choose, drivers are able to achieve some pretty impressive fuel economy. Its base engine achieves an estimated 20 city / 30 hwy MPG, while the ratings drop a bit for its V6 options. The 3.5-liter option earns an EPA-estimated 18 city / 26 hwy MPG, while the 2.7-liter engine gets 17 city / 24 hwy. Whichever option you choose, the Edge still offers an affordable fuel economy and an impressive performance. Earning a 5-star safety rating in its government safety testing, drivers can feel safe behind the wheel of the 2017 Ford Edge. It comes with a long list of standard safety features including a rearview camera, hill hold assist, emergency crash notifications, the Ford MyKey system, rear parking sensors, blind spot monitoring, inflatable rear seatbelts, rear cross-attractive alerts, forward collision warnings and lane departure warnings. As you can see, the 2017 Ford Edge has the makings of both an efficient, everyday commuter car, and a thrill-seeking powerhouse of an SUV. Whichever model you choose for the Ford Edge, we’re sure you’ll be satisfied with its impressive features and specs. Some of its available interior tech include a heated steering wheel, 12-speaker Sony sound system, automatic high beams, rear seat entertainment system, LED taillights, HD radio and more. If you’re interested in getting behind the wheel of this impressive model, contact us here at Houston Ford of Pine River. We’ll be more than happy to schedule a test drive in the model of your choice so you can experience its powerful performance first-hand. Read more about the Edge on our Blog!